Eating disorders are generally viewed as problems that occur in young women and girls. This is not true as they can affect anyone at any age, men and the older generations included. There are many reasons why those in then older generations may suffer from an eating disorder; these reasons could be financial, emotional, relating to ability to cook and feed oneself, because of illness or simply because they no longer have the energy to maintain their own health. Tight pensions and expensive fuel bills can significantly contribute to a person being unable to feed themselves sufficiently, and a new debate of ‘food or fuel’ is constantly being discussed in the daily papers. Older people are a lot less likely to eat healthily during the winter months as their finances are taken up maintaining their homes with heat. Also the cold weather can prevent a lot of people from being able or motivated to do any shopping, which is when friends, family and carers can be extremely valuable. 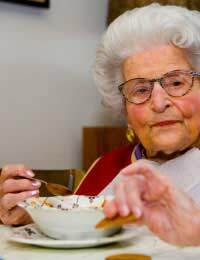 There are many emotional factors that can contribute to an elderly person developing an eating disorder. Depression can count for a large part of this reason, and a lack of motivation and enthusiasm can all add up to a person not being ‘bothered’ about their own health needs. They often deny the problem to those around them, and some might even stop eating in objection to their changing circumstances such as when they are in hospital or moved into residential care. Often they no longer wish to survive and give up caring about their own needs. Many of the illnesses that occur with age can prevent a person from being able to cook and feed themselves. Arthritis can be a severely debilitating disorder which can cause large amounts of pain and disfigurement to joints rendering them useless for performing some activities such as opening tins or jars. Many devices have been designed to aid these activities and are often inexpensive, but denial or very tight budgets may prevent the purchase. Families and carers may be unaware of the lack of diet in their friend or relative and may not notice that are not eating sufficient amounts until a significant amount of weight is lost, especially if they do not reside with them and visit them sporadically. Many illnesses can reduce appetite, and as many of the illnesses that are associated with older people can be quite prolonged, it is essential that daily living needs such as diet are discussed with the GP or nurses.The fear of constipation that can be associated with many painkillers can also contribute to a person not wanting to eat very much also. Other factors include metabolic rate and digestive process which can all slow down as we get older meaning that food stays in the system longer and is not turned and used into energy as it is in the young. There are so many reasons why an older person may develop an eating disorder, these can be complex emotional and psychological issues or an inability to be able to carry out the activities that are needed to shop, cook and eat a healthy diet.